The StrongArm SUP Loader is the answer to safe and easy single person loading of Stand Up Paddle Boards, lightweight (60lbs) canoes, or kayaks onto a vehicle roof. Made from powder coated aluminum with a steel base that locates over a 2 inch tow ball. It is held in place with Tee bolts that hand tighten against the tow bar. This secures the StrongArm during the loading and unloading of a board or kayak but enables the StrongArm to be quickly assembled and removed (about 15 sec) from the car when finished. 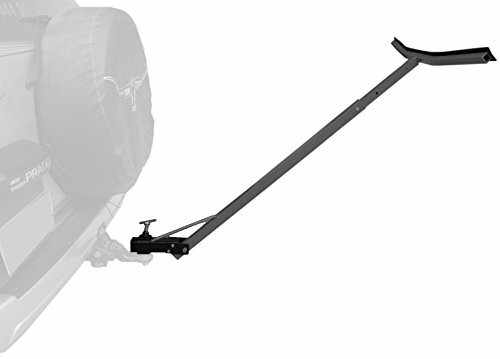 The StrongArm SUP Loader can be adjusted by up to 9 inches in height to suit vehicles from sedans to SUVs and is designed to sit about 2 inches below the roof rack level. A standard 2 inch tow ball. We have noticed paddle boards boards can be damaged much easier than surfboards due to the way they are made. The damage especially is apparent when loading on and off your vehicle roof rack. To alleviate this ongoing problem we bought a SUP board cover and tried loading with our StrongArm SUP Loader and found it works brilliantly. What better way to solve this problem? If you have any questions about this product by Strong Arm, contact us by completing and submitting the form below. If you are looking for a specif part number, please include it with your message.